UNICEF Goodwill Ambassador David Beckham journeyed to Tacloban in the Philippines today to meet children saved from the devastation of Typhoon Haiyan. 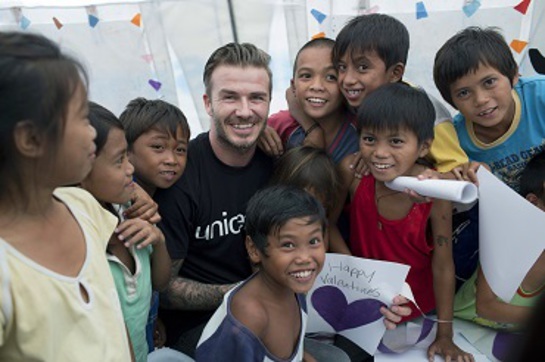 David Beckham made Valentine's Day cards with child survivors of Typhoon Haiyan at a UNICEF-supported child-friendly space at one of Tacloban's major evacuation points. Beckham saw UNICEF’s vital emergency work for children, including visiting a child-friendly space at one of Tacloban’s major evacuation points. “I was humbled to visit Tacloban and see how people are still so full of spirit despite the devastation they have suffered. Close to 6 million children are affected and many have lost loved ones,” said Beckham.